I saw them from the window as the car from the airport turned onto the Custom House Quay on the way to St. Stephen’s Green. 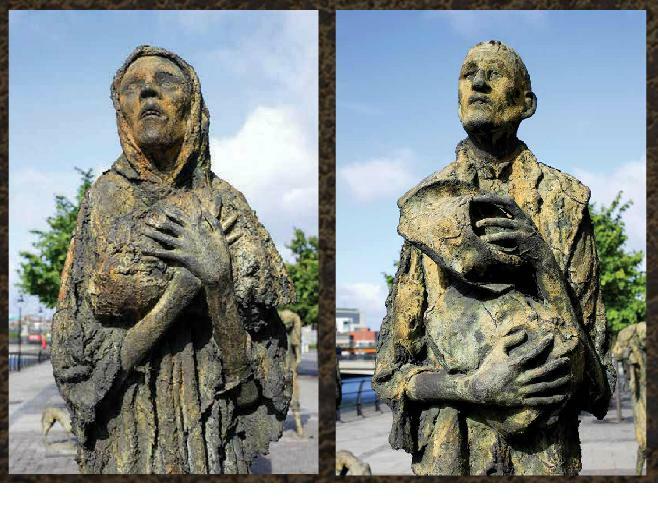 There on the sidewalk along the River Liffey were six gaunt, bronze figures, starving ghosts trudging a despairing path toward the Dublin dockside to board centuries-gone emigration boats to North America. 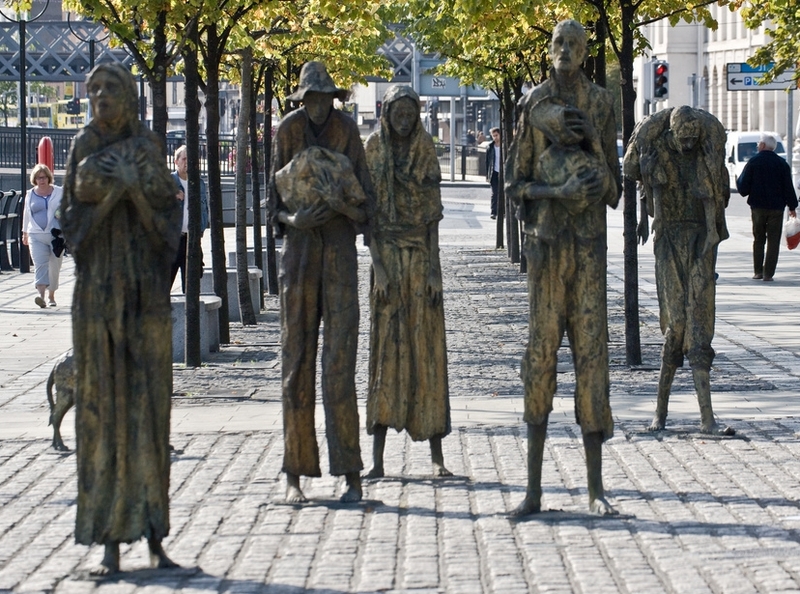 It was Rowan Gillespie’s sculpted monument to the Great Famine of the late 1840’s in Ireland, where over a million people died and another million had to emigrate. I knew the piece was in Dublin but had never seen it in person. Tired from the long flight, I almost missed the figures, small and incongruent among the commercial buildings of modern Ireland. But when I did recognize them the effect was jarring. I tried to think of a similar public monument to the underclass, to poverty that existed in my own country but could not. In one way that is understandable. The Great Famine in Ireland, triggered by potato blight, starved the country even while the Irish agricultural engine was still exporting food to England on behalf of absentee English and Anglo-Irish landlords. That brutality produced a direct link from the Great Hunger to Irish Republicanism so the starvation monuments are in that sense nationalistic rather than purely empathetic. But to an American visitor, groggy from a day of transatlantic travel, the rough bronze figures set among the modern cars, buses and office buildings appeared like shards of useless metal on some great manufacturing room floor, the unimportant shavings left when the economic milling machine had smoothed away the rough edges of national commercial efficiency. Would we profit from a similar public reminder? I think so. The current American political debate is often dogmatic and extreme, socialism versus market economy. The national reality is actually a precarious balance, one that presupposes constant healthy argument on the appropriate role of government, its institutional competency to perform its role, and the impact of government on essential market forces. Not every government intervention is socialism; not every underclass is a “moocher”; not all income inequality is bad, nor is self-interest inevitably oppressive. Balance is difficult and when corporate scale and income concentration become too great (as during the Gilded Age) a self-aware society responds if for no other reason than its own interest. As American economic growth is concentrated on a smaller and smaller set of citizens, we may now be at that point again but our ability to respond by consensus is dulled by dogma, platitude and a commitment to philosophical purity. So perhaps among the American private monuments to the marketplace, the corporate campuses, bank skyscrapers, and malls, we need some sort of public monument to the poor. It might remind us that a market based national economic engine will inexorably purge itself of unproductive materials and grind ferociously away the rough edges of inefficiency. But the discarded human chips and pieces of unproductivity have faces and families and, if unattended, can fuel revolutions. And in that important sense our monument to poverty might appeal to the empathetic and the self-interested alike. Application: Here are two brief passages you may want to memorize or make note of. “He defended the cause of the poor and needy, and so all went well. Is that not what it means to know me?” declares the LORD. Hopefully we will find political leaders willing to have a reasoned discourse on a tough subject. I believe history has taught us that large wealth gaps between a small group at the top and a large group at the bottom does not end well? No kidding! I am at least pleased that the topic is out there for public debate…less optimistic that it will be reasoned discourse but let’s see.